Highly durable and designed to your specifications, our wall panel systems are built for long-term value. When you’re ready to improve the livability and appearance of your basement, one of the most important factors that you need to consider is what you’ll be using for your basement walls! Not only do you want a space that looks great, but it also needs to hold-up to humidity, temperature shifts, and pests—which is exactly what you’ll find with an Aurora basement wall assembly from Matrix Basement Systems. With the installation of basement wall systems from our premier remodeling company, you’ll be making a smart investment in the long-term performance of your home. Whether you are looking for a home theatre remodel or want to create a comfortable place to spend time with family with a basement remodeling project, our wall panels are customized to the needs, style, and layout of your space. Resistant to Moisture: Water will have no effect on your basement walls, and our moisture-proof wall systems are designed to resist growth of mold and mildew. Designed for Safety: Non-toxic, insect-proof, and resistant to fire and impacts, you won’t find better security and durability than with our basement wall systems. Styled to Your Home: There’s no one-size-fits-all look for a basement system, and we can customize your walls to look like drywall and complement your local home. Guaranteed for Quality: Matrix Basement Systems stands behind the quality of our products and services with exclusive warranties that protect your investment. 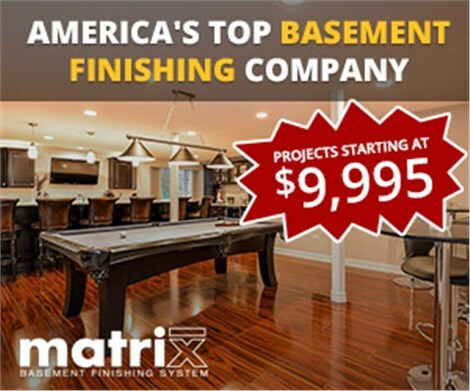 At Matrix Basement Systems, we’re a Chicago basement remodel company with a history of excellence within the industry, and our experienced crew has successfully completed over 3,000 basements since 2009! Learn more about how our wall systems can give your basement the style and durability that it needs by giving us a call today, or request a free price quote and no-obligation consultation by filling out our online form now.